We have long been admirers of Michel Guignier’s wines having sampled them in Paris and at the famous Manfreds bar in Copenhagen. It goes without saying that Michel practices organic and biodynamic viticulture (he is certified by Agriculture Biologique and Demeter) and makes his wines without any additions. No industrial yeast, no added enzymes, no acidification, no filtering, no fining, no sugar, no new oak and no added sulphites. But there is more than that going on here. 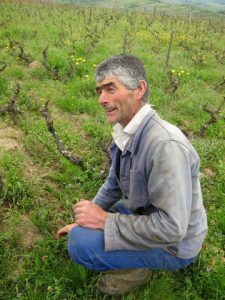 Michel believes passionately in biodiversity and soil quality and his vines are dotted through his farm which sits in the middle of the forests that surround the village of Vauxrenard. In the photo below you can see the vast monocultures around Fleurie (on the right) and Chiroubles (to the south). 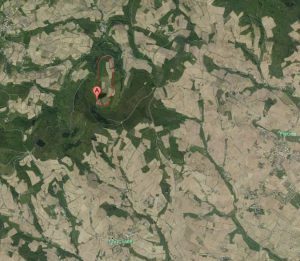 You can also see Michel’s farm in the centre surrounded by forest. It is this forest and the careful management of the land that promotes the biodiversity that is so essential for the health of the grapes. The elevation here ensures slower growth as it is 500 metres above sea level. 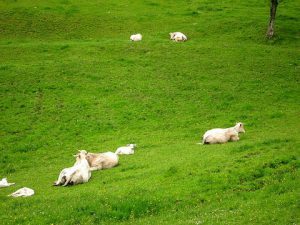 Here Charolais cows and a single working horse called Bistere graze contentedly on the rich pastures, and in winter they wander through the vineyards eating the grass that grows under the vines and between the rows. In doing so they also add natural fertiliser to the vineyards. Michel uses Bistere to plough between the rows, which helps encourage the roots of the vines to seek refuge deeper into the earth where they find water and minerals to sustain themselves. 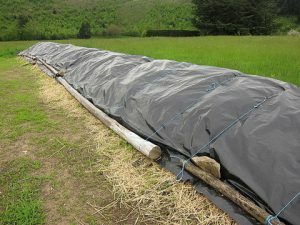 In keeping with his biodynamic practices, Michel prepares huge mounds of compost each year from cow droppings and includes the must of last year’s vintage. 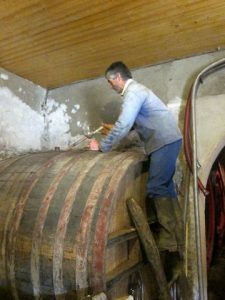 In his winery there are lots of different barrels, tanks, foudres and eight concrete tanks lined with epoxy for fermenting and maturing the wine. Michel extracting a sample for us to try! He has a number of vineyards around Vauxrenard as well as others in Fleurie and Moulin a Vent. La Bonne Pioche is a lovely 7 hectare vineyard near Vauxrenard with vines that are thirty years old. It faces south east and the soil is friable granite. He has another 4 hectares of vines in Fleurie and Moulin a Vent. One of the plots has vines that are more than 75 years old. All his grapes are fermented in concrete tanks with epoxy lining and he uses a semi-carbonic method of fermentation. Oh…! 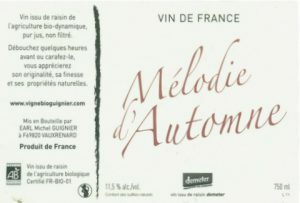 is an easy drinking, totally gulpable wine from Michel Guignier that is designed for drinking now rather than keeping. It is made from grapes taken from the vineyards around his house which lies just outside the village of Vauxrenard which is quite close to the cru village of Fleurie. Like all red wines from Beaujolais it is made from 100% Gamay grapes. Michel tends all his vineyards biodynamically using no chemical sprays in the vineyards and absolutely no additions in the winemaking process. No sulphur is added to this wine at any time which accounts for how lively it is to drink. This is a light, ethereal wine that gradually engulfs you with waves of flavour from the purity of the fruit in this wine. Michel often makes a lighter, fresher wine which he macerates for only 6 or 7 days in the concrete vats rather than the longer 10 to 15 days for his more structured wines such as the Fleurie. The method of fermentation involves whole bunches being placed in the concrete vats and carbonic maceration allowed to commence. The weight of the bunches however means that some juice will escape and begin alcoholic fermentation at the same time which is why we say it is semi-carbonic maceration. When we first tried it at the Renaissance event in Angers this year we were immediately captivated by its charms. As with all of Michel’s wines, there are no sulphites added at any time. La Bonne Pioche is one of Michel’s best known wines. 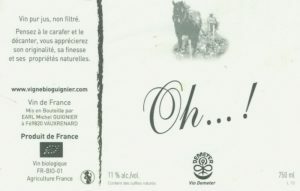 It is released under the Beaujolais Villages appellation (he could have called it Beaujolais Villages Vauxrenard, adding his local village name which is one of the villages that are entitled to appear on the label, but most growers think that so few people know the individual Beaujolais villages that it is not worth it). This is a beautiful, lively expression of the Gamay grape which is picked from vines over 45 years old and then pressed in an old basket press. The fact that absolutely no sulphur has been added to this wine (and nothing else has been added or taken away) makes it compelling drinking. It is such a joy to drink wines made by a master winemaker such as Michel where wood, sulphur and extraction just don’t feature! Michel produces an extraordinary rosé which is light, vibrant and lively. This is released under the Vin de France appellation. The vines from which this wine is made are over 30 years old. The wine is macerated for about 18 hours to ensure that some colour has leached into the juice from the skins. The wine has a great depth of flavour despite the light touch. It is also perfect for summer day time drinking at only 11% alcohol. 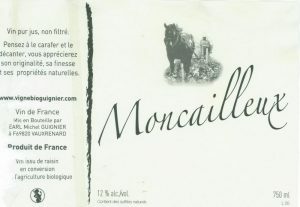 The label shows Michel working in the vineyards with his trusty horse Bistere. This delightful Fleurie is made from grapes grown on vines that thrive in sandstone rather than granite. This wine was fermented in concrete tanks lined with epoxy resin using whole bunches of grapes and, after pressing, transferred to large, old wooden barrels of between 20 hectolitres and 37 hectolitres in capacity. The wine exhibits the most delicate characters of his cru Beaujolais wines. While this wine is characteristic of a Fleurie it appears lighter, perhaps due to the sandstone rather than granite terroir. 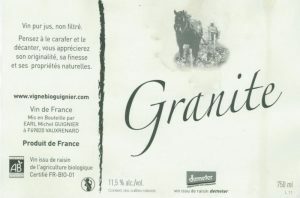 The Granite is made from grapes grown in the beautiful vineyards near Michel’s house which is on a hill outside Vauxrenard. This wine was fermented in concrete tanks lined with epoxy resin using whole bunches of grapes and, after pressing, transferred to large, old wooden barrels of between 20 hectolitres and 37 hectolitres in capacity. At a recent tasting, this was a stand-out wine. It is smooth, elegant, subtle, complex and exhibits great structure. And it is only 11.5% alcohol! This fascinating wine is a blend of two older vintages (2004 and 2006). We love this wine because it demonstrates the lasting qualities of Michel’s products. Because it is a blend of different vintages it cannot carry the appellation on the label therefore it is classified as a Vin de France. 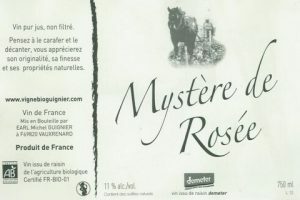 The label for this wine shows his faithful horse, Bisterre, who plows the vineyards with Michel. Each of the wines were fermented in concrete tanks lined with epoxy resin using whole bunches of grapes and, after pressing, transferred to large, old wooden barrels of between 20 hectolitres and 37 hectolitres in capacity. We love Moulin à Vent wines for their structure and their minerality and nervy energy derived from the decayed granitic soils. Michel makes his wines the way we love them. They exhibit delicately perfumed aromas, velvety texture, deep colour and incredible lightness combined with a long, satisfying, lingering finish. What you have here is a master in the vineyard producing perfect, biodynamic fruit and the same mastery showing in the winemaking allowing the fruit to ferment and mature with little intervention and absolutely no additions including sulphur. Despite the lack of sulphur, this wine will cellar nicely for up to ten years or can be drunk right now! The vines in the Moncailleux vineyard are over 60 years old and grow in the Moulin a Vent appellation although Michel prefers to label it as a Vin de France. The wine appears incredibly light at first sip, but gradually the power, structure and concentration of the fruit begins to impact. A delicious and memorable wine. This wine is one that Michel makes sometimes by blending some of his wines in three large barrels called tonneau which have a capacity of 900 litres each. 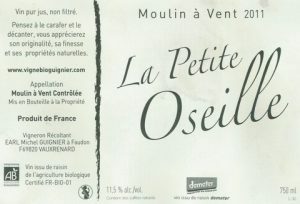 The 2011 vintage is a mix of Beaujolais Villages Vauxrenard Bistère, Moulin à Vent La Petite Oseille, Fleurie Au Bon Grès and Vin de France Granite. This is a quite compelling wine with a beautiful silkiness on the palate. 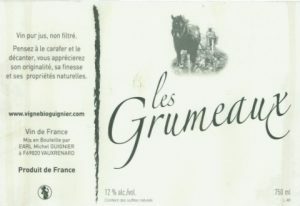 This wine is classified as a named village appellation indicating that the wines produced in this area are superior quality to the normal Beaujolais wines. So it is a Beaujolais Villages wine and the named village is Vauxrenard which is where some of Michel’s vineyards are maintained. It is just slightly north-west of the village of Fleurie. The wine is called Bistère because that is the name of his faithful horse that he uses to plow his vineyards. This is an elegant, lively, precise wine of considerable charm. We recently read a report of famed French chef Alain Ducasse who was dining at the wonderful Manfreds in Copenhagen. On being served a 2007 vintage Guignier’s Bisterre said it was the “best Beaujolais I’ve tasted in a long time“. We can but agree!